If there’s a bike locked up somewhere in Woodbridge, there’s a good chance it’s chained up to one of Alex Porbe’s creative designs. 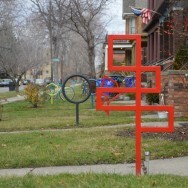 His unique bike racks dot the neighborhood. It’s one of the many approaches at metal he’s finely tuned over the decades of living in the area. He’s seen Woodbridge change, and his functional art is now a permanent part of what makes Woodbridge glow. In the course of an artist’s career, directives shift, ideals change, standards and approaches evolve, and mediums ebb and flow in their immediacy to an artist’s vision. Alex Porbe has largely avoided the part where confusion sets in and the abstract dissent of a polymath takes hold. 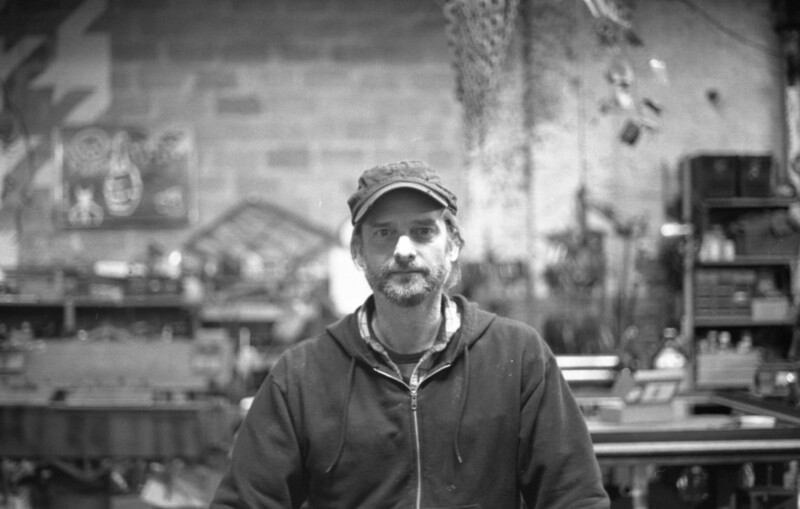 He is an industrial designer — in that, he makes functional things, but he is also an artist. Hailing from the eastern part of the Detroit area, Porbe graduated from the College for Creative Studies in 1991 and began fine-tuning his approach at metal. Detroit, ostensibly was a good place to coddle that creative, metal spirit. Hearing the term industrial design alongside the name Detroit — there’s not much standing between the two. Avoiding the word ‘synonymous,’ there are probably a handful of American cities that would end up on brainstorm branch for the term industrial design. Detroit is likely at the top. Detroit is a city born of wood and horses, rebirthed in metal, burned by its excess, and now partly resurrected because of it. I met with Alex in the upstairs, makeshift office-space at the workshop on East Mack. AP: I grew up in Gross Pointe Park, but I spent my time downtown. I had three shops before coming here. I was gone for ten years and had a farmhouse outside of Ann Arbor. I had a shop out there, but I always maintained ties here — to the guys in this building. When it came time to to come back to Detroit, Jason (Huffines) mentioned I could come in and we’d make a super-shop out of this. From then I went on a few job interviews for product design. I was always a shop rat. I spent a lot of time in the shop molding stuff and welding, things like that. I was really inspired by some friends of mine in the Propeller Group who were doing some industrial art in Detroit at the time. Those guys were mostly industrial design students from CCS who started doing creative furniture pieces and functional art. They got a show in Japan and made a lot of big news with some of their work. They inspired me, coming out of CCS to get started on my own thing like that — sort of a group effort with artists, collaborating. We rented an old warehouse in Corktown, took that over, started making art and selling. We had art openings, parties; our bands played in there. I just started wooing architects and designers with some of the things I was working on. I started getting small projects from them and it sort of grew from there. TL: So you didn’t start with the bike racks? AP: The work is all over the place. That’s just one aspect of what we can do. I say we because I’ve got a few people who work with me. My background being in industrial design — I do a lot of interior stuff also: bars, custom railing, custom lighting, things of that nature. Some of the bigger projects I’ve done around town are the CPOP sign for the gallery next to the Majestic Theatre. We did that in ’99. We started working with a lot of architects and developers doing restaurant interiors. Ron Rae was one designers I worked closely with over the years. He’s done quite a bit of work with his old firm. They did Somerset Mall and big projects like that, so he brought me into the fold. We did a lot of Taubman projects, a lot of malls, out of state projects, interior components. We did the Coach Insignia, at the GM building, a bunch of the Andiamo restaurants. Recently we did the Tesla tower on top of Jack White’s building, which was a super fun project. Now, we’re working on a couple of bars for the Daytona International Speedway. Those are shipping out at the end of the month. It’s a crazy, fast-paced project, and they’re very sculptural too which is a fun thing. TL: How did you wind up doing work in Woodbridge? AP: Years and years ago, probably ’97 or ’98, I moved in with a couple of friends of mine in a house on Trumbull near Warren. I never met the landlord but apparently it was Larry. All these years later, I got introduced by Amy Swift. 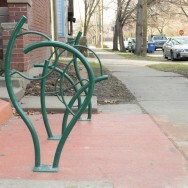 We just did these bike racks for him last summer. 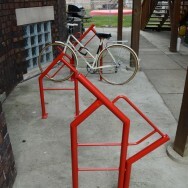 He had a need for the bike racks so I came in and took a look at what else was done there and kind of did my own riff on it. TL: Industrial design in Detroit, talk about what that means. AP: In the traditional sense, of course, it involves the automotive field, and product design somewhat. But, things have really changed in the last five years around here, as you know. There’s all kinds of things going on. I saw something online today about Detroit being designated a City of Design by UNESCO. There’s a lot of attention being paid to Detroit, which is great. I’ve always stuck it out, here, since I graduated. A lot of the industrial design talent that comes out of CCS — a lot of these people leave, and I think we’re starting to see people sticking around more and more, now. I had my reasons for staying, which were many. I had opportunities to go to New York and LA but I chose to stay here. I was able to put down the roots to be ready to go when all this stuff hit. We’re doing a lot of work now. TL: Did you anticipate the snowball effect? AP: Not really, but I think that Detroit was always going to come around. Some of these people that came in, like Quicken Loans, they brought a lot of young people into the city who desired to live here, and that was obviously going to shape the retail and service industries. Shinola and others coming in got other people motivated on a smaller level of investment. That’s important. People are willing to take more of a risk. TL: Are you getting to a point where you might move out of this shared space? AP: Not for now. We’ve got a really good thing going here. All of us have been friends for 15-20 years. It’s very harmonious in terms of what gets done and who does what. We share resources and help each other with projects. Sometimes it gets a bit cramped. Sometimes the egos fly a little bit, but it’s good. It’s a great location and a good space, so we’ll probably dig in here for a while. AP: It’s interesting to see people coming in from out of town, putting down roots and making art here. I’d like to see that continue; it’s sort of a melting pot. It’s becoming culturally diverse with the different artists here. I hope there’s more of an opportunity for people to sell their art. I don’t want to say it’s easy, but you can come to Detroit and make art. You read about people coming from Paris, New York, LA, wherever. That’s great. Come here, get cheap rent and make art. That’s great, but who’s buying your art. Who is going to buy it? That’s still a struggle. I think for some young people who have artistic sensibilities, as they get older and start to make more money, there will be a new wave of art supporters in the city. TL: When you see your work around town, it’s different than when a poet sees their poem in a magazine, or when a photographer sees their work on a wall. But, there’s a sense of satisfaction that you’re part of creating what some people would call “New Detroit.”How does it feel to recognize that you’re part of that, as an artist? AP: It’s exciting for any artist to be recognized for their work in a positive way, obviously. I appreciate when people respond that way, but it’s not for everyone, too. Sometimes people don’t like something. I’ve done shows with individual art pieces and functional art and sold them at shows. Sometimes they don’t sell well, or people don’t respond to it. Sometimes a lot of stuff sells, you never know. So, there’s always that — art being objective. But it’s been pretty satisfying to be part of the renaissance going on in Detroit, especially with the focus being put on art and design right now. People are putting a lot of attention on that. Everyone’s thriving. The architects I’ve worked with for years and years, they’ve relocated to downtown and they’re doing amazing projects. I just wish that it happened twenty years ago. Timing, I guess. Everything had to be in place, just right. There’s no city like this in the world, and there probably never will be. It’s ripe for some type of renaissance. It’s always been a pioneering town, anyway.